Climate change is hitting the Arctic faster and harder than previously thought, according to a new WWF report. Note: Be sure to check out our sister site ClimateShift.com for more climate change and global warming related archives and information. Climate change is having a greater and faster impact on the Arctic than previously thought, according to a new study by the WWF. The new report, called Arctic Climate Impact Science � An Update Since ACIA, represents the most wide-ranging reviews of arctic climate impact science since the Arctic Climate Impact Assessment (ACIA) was published in 2005. The new study found that change was occurring in all arctic systems, impacting on the atmosphere and oceans, sea ice and ice sheets, snow and permafrost, as well as species and populations, food webs, ecosystems and human societies. 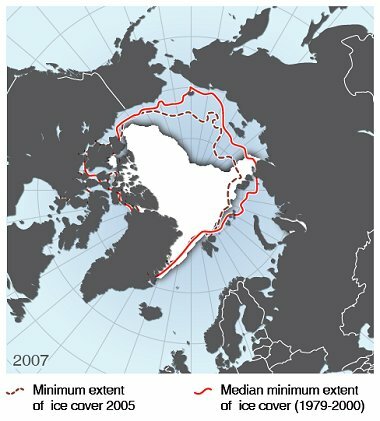 Melting of arctic sea ice and the Greenland Ice Sheet was found to be severely accelerated, now even prompting the expert scientists to discuss whether both may be close to their "tipping point" (the point where, because of climate change, natural systems may experience sudden, rapid and possibly irreversible change). "The magnitude of the physical and ecological changes in the Arctic creates an unprecedented challenge for governments, the corporate sector, community leaders and conservationists to create the conditions under which arctic natural systems have the best chance to adapt," said Dr Martin Sommerkorn, one of the report�s authors and Senior Climate Change Adviser at WWF International�s Arctic Programme. "The debate can no longer focus only on creating protected areas and allowing arctic ecosystems to find their balance." According to last year�s reports of the Intergovernmental Panel on Climate Change, if the entire Greenland Ice Sheet were to melt, sea levels would rise 7.3 metres, making its status a global concern. While it is currently impossible to accurately predict how much of the ice sheet will be melting, and over which time, the new report shows there has been a far greater loss of ice mass in the past few years, much more than had been predicted by scientific models. Likewise, the loss of summer arctic sea ice has increased dramatically, with record lows reached in 2005 and � way more dramatic � in 2007. In September 2007, the sea ice shrank to 39 per cent below its 1979-2000 mean, the lowest since satellite monitoring began in 1979 and also the lowest for the entire 20th century based on monitoring from ships and aircraft. "When you look in detail at the science behind the recent arctic changes it becomes painfully clear how our understanding of climate impacts lags behind the changes that we are already seeing in the Arctic," said Sommerkorn. "This is extremely dangerous, as some of these arctic changes have the potential to substantially warm the earth beyond what models currently forecast. That is because climate models don�t currently adequately incorporate important underlying drivers of the arctic changes we are already observing, such as the interaction between sea ice thickness and water temperature." The Arctic is not only one of the places on earth most vulnerable to climate change, but also a place where vulnerability is of urgent global relevance. WWF calls for a two-pronged strategy to minimize the impacts of climate change. "We need to reduce global emissions of greenhouse gases to levels that will avoid the continued warming of the Arctic and the anticipated resulting disruption of the global climate system," said Sommerkorn. "At the same time, we need to simultaneously reduce the vulnerability of social and environmental systems of the Arctic by reducing threats from human activity and building ecosystem resilience � the ability of ecosystems to remain stable when under a lot of pressure." WWF will launch this report at a meeting of the Arctic Council, the intergovernmental forum of arctic nations on Thursday. "It is now in the hands of the arctic nations to act upon this evidence for climate impacts," said Sommerkorn. "They can make a difference if they act strongly, and fast. It is not too late to throw the wheel around. It is just way too late for business as usual." TO DOWNLOAD THE FULL REPORT, CLICK HERE [pdf, 3.27 MB] Note that right-clicking your mouse and saving the file to your computer often works best.